Freemasons under the 33 degree have no clue whatsoever what they are doing. They have no idea what goes on behind the 33rd door. whilst their superiors are in communion with Luciferian JEWS. Battles/wars, Mexican–American War · American Civil War. Albert Pike ( December 29, 1809 – April 2, 1891) was an attorney, soldier, writer, and Freemason. Jews and Freemasons — a not-so-secret brotherhood – J. SOME SEPHARDIC JEWS IN FREEMASONRY | MASONIC PAPERS by RW Bro. LEON ZELDIS. PS Review of Freemasonry. The Israeli NWO tips their hand. This report will shock and upset some. Now is the time to write it--Knowing it could be misunderstood as anti-Semitic. God forbid that I a Jew should ever say or do anything that would be remotely considered as such, but I must admit this report does not come easy for me. The fact still remains that an evil force has been put into place in Jerusalem and has spread throughout Israel, in preparations for the end time and the seat of the anti-Christ. For if we are to believe that the anti-Christ is to have his seat on the Temple Mount, then we must come to grips with some truths not being preached today. One such truth is the foundation for such a move by the Devil must be already underway even as we speak, Or we simply are not in "end days" of an epoch. This report will prove that such a move is underway and has been for quite some time. 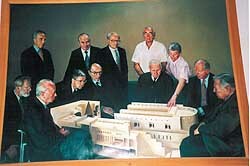 In this report are many pictures showing the establishment of Illuminati-established proof that there is a plot by those we refer to as the New World Order to Show in architectural design of the New Israeli Supreme Court Building designed and paid for by the Rothchilds, a presence of Free Masonry and the Illuminati in Israel. I [Jerry Golden] took all but one of the pictures you see here so I can assure that what you are seeing is real and actually in place. The same families who own and control the Federal Reserve and other major financial institutions have their eyes set on the Temple Mount and the Holy City of Jerusalem. Just as Scriptures say, the man who will be revealed as the anti-Christ will sit there before the appearance of the Jewish Messiah Yeshua HaMashiach, and many will receive him as their messiah. Just actually how that will come about remains to be seen, but one thing I am convinced of is that Holy men of God will not be the ones to rebuild the Temple--it will be Illuminati. For God would not send men to that place to perform blood sacrifices. His Son’s blood was the perfect sacrifice; there is no need to shed the blood of dumb animals any longer. Yeshua did a perfect work, and it was finished. But He will return and take control of the New Temple that I feel will be built soon enough. Anti-Christ can be accepted by most "Christians" as savior who can bring peace and order to the world. But then you know the rest of that story. For those who may think this article is anti-Semitic, I ask you to read an article on The House Of Satan, http://www.thegoldenreport.com/articles.asp?id=00135 ; for there are those who call themselves Jews but who are of the house of Satan. And many have found their way into the Israeli Knesset and they don't even mention nor deal with the Covenant of Yahweh. Once again Yeshua will enter into that place--the Holy Mountain of God--and cleanse it. But before that happens all hell will break loose in Jerusalem and the world. So with all that said, I will now show you what have never been published before, for the few who are aware have been afraid to speak of it. Please pray over this servant of God for protection as we go forth with these truths. These truths must be revealed in order for the Body to know how close we are the end of this age. This entire report will be built around the construction of this building ordered by the Rothchilds. 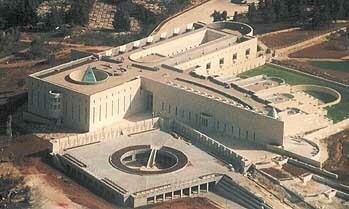 A friend of mine took this picture of the Israeli Supreme Court as he and his wife flew over the area a couple years ago. 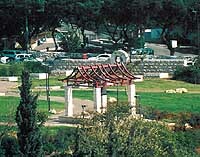 The Supreme Court building sits on a plot of land opposite the Knesset and next to the Foreign Ministry and the Central bank of Israel. It is important to keep in mind that it sits in line with the Knesset, for we will be talking about Ley-Lines that cross under this pyramid running to the Knesset, with other ley-lines that cross in perfect order to the center of Jerusalem and on to the Rockefellow Museum. Everything about this building has been thought out to the very finest detail, and it is diabolical. The Devils plan has been put into place before we ever realize it. He knows his final battle will be here in Jerusalem. The Engineers who were chosen for this job by the Rothschild’s were the grandson and granddaughter of Ben-Zion Guine from Turkey who worked for Baron Rothschild, Ram Kurmi, born in Jerusalem in 1931, and Ada Karmi-Melanede born in Tel-Aviv in 1936. This was in a time well before equipment leasing for materials and machines, and they were the type of people that wouldn't have needed it anyway. For those who can make something out of the numbers. It was important to the builder to have everything done according to the correct numbers. There were 1,000 sheets of plans, 1,200 cement posts; they worked on the building for 3 years or 750 days. 20 workers each day, for 200,000 workdays, 250,000 building stones, each hand placed. The first thing you will notice is the pyramid with the all Seeing Eye just like the one you will see on the American dollar bill, it sits in a circle to the left. We will elaborate on this a little later in this article. The larger circle you see at the bottom of the picture is an inverted-cross designed to walk on. It is the only religious emblem designed to be trampled on under foot. Next, at the top of the next picture is a Moslem Gravesite, and just out of view to the right is an Egyptian Obelisk. And all through the building you will detect Hindu Altars. All of this will make more sense as we go along, keep in mind we are talking about the establishment of a form of Government that will usher in the anti-Christ. There is little proof on the building itself of the presence of the Rothschild’s but on an outside wall we find these two items. Pointing to the garden that displays the Egyptian obelisk. After passing through security the first thing you will notice on the left wall is a large picture. Giving recognition to the Rothschilds, you will notice the Rothschilds emblem at the top. It is the symbol for the founder of the Rothschild Dynasty and his five sons, who established central banks throughout Europe. The Rothschilds made several stipulations with the Israeli Government before the building began, among them were. The Rothschilds would pick the plot of land to build the Supreme Court; they would use their own architects, and no one would ever know how much the building cost. It took them four years to build this structure with many secrets built into it. From the left you will see Teddy Kollek, then Lord Rothschild, on the right standing you will see Shimon Peres, and setting at the bottom left Yhzhak Rabin. And others who brought us the Olso death process that we are now faced with. But this is where our journey begins as we begin to enter into the building, for this entire journey is intended to bring one from darkness into the light, and become an Illuminated one. You first enter into an area with very dim lighting, but as you look up the stairs you see the bright light that comes from a very large window that over looks parts of Jerusalem. Here it is very important to count the steps; there are three sets of 10 steps, making a total of 30. As you ascend these 30 steps you come from the darkness into the light. And from here you can see the world or in this case the city of Jerusalem like you haven’t seen it before. It is also worth mentioning that on the left side you will see the old Jerusalem Stone, some even believe these same stones were used in the second Temple, but I have no way to prove that. On the other side you will see the smooth modern wall. There are 6 lamp stands going up that speaks to man in his journey to gain knowledge and become illuminated. But once again I feel it necessary to tell you that it’s very important to the ones who built this building that everything be perfect and in their order of things, even numerically. As we turn to the left and begin to walk towards the Pyramid we notice a metal strip in the marble floor. The Ley-Lines cross directly under the pyramid they run from this place to different places in the city. It is where the Judges and others can stand to receive knowledge and power. Standing directly over a piece of crystal with the all Seeing Eye of Lucifer the light bearer above them. For those who are not aware of the term Ley-Lines, it is lines in geographical places that Witches, Warlock, and Wizards walk claiming for the Devil. If you will notice in every large city all palm readers and such are usually on the same street that is a ley-line. 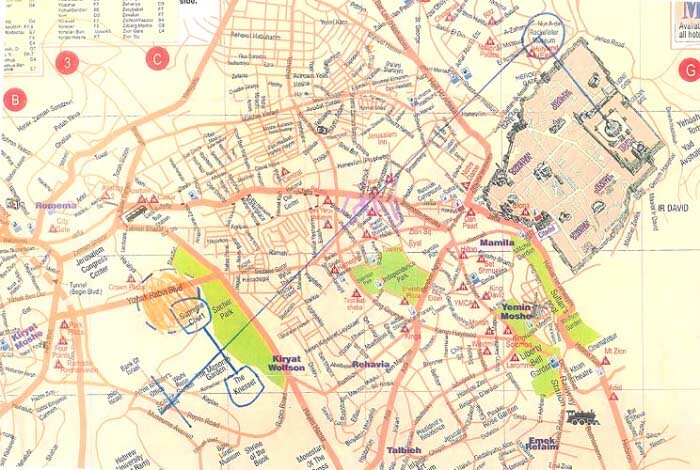 Here is a map of Jerusalem, you can see that the Supreme Court Building and the Knesset are connected with one straight line, and at a 90% angle to that line half way is a Ley-line that runs perpendicular. That line runs straight down the middle of a street known as Ben Yehuda, a place where all the crazies meet, and at any given day you can find at least one who calls himself Elijah or Moses. Israelis call Ben Yehuda the freak show. That line runs on to the Rockefeller Museum; and from the Rockefeller Museum a line runs through the Moslem Quarters to the Temple Mount. I will make this map a little larger to help you out some. Just before entering under the pyramid there is a window you can look up at the pyramid, you will notice the ley-line that runs to the center of the pyramid. For a moment lets go back to the top of the 30 steps, as we know there are 33 degrees in Free Masonry but the last three are the ones of higher learning and preparations to enter the Illuminati. So as we move from the top of the stairs towards the Pyramid we see a great library with three tiers to those three levels of higher learner. They three final steps in Free Masonry and after that if ones choose to go higher and have been accepted they enter the highest levels of the Illuminati. It is also important in this building to note that the 33rd level ends at the base of the Pyramid. This is a very large and expensive Library, but there is something else about this one that should be mentioned. The first tier is "only" for Lawyers; the second tier is "only" for setting Judges. The highest and third tier is "only" for retired judges. Which also speaks of the order of things in the Illuminati, as one must be accepted and move to the higher level before the knowledge at that level is available to them. And directly above that third tier is the Pyramid with the all seeing eye of Luther. That begins the journey into the Illuminati. Directly under the Pyramid you see 6 squares. Six being the number of man, and each square has 4 sides speaking to the world. In the center directly under the point of the pyramid a crystal so that when one stand over it he of she is in direct line from the point of the pyramid and the crystal below. There are five Courtrooms, each has an entrance in the shape of a Jewish Tomb, with the opening above the door for the spirit to have freedom to enter or leave. The wall with the courtroom entrances has a curve to it, while the outer wall is straight. There are two things said about his, some say it speaks to the straight line of Justice, and the curve line of Mercy, yet others say it speaks of order out of chaos. The motto of the Illuminati. There are three Judges who set in each courtroom, and above the seats of the Judges there are smaller pyramids that shed light onto the Judges as they sit over those who are brought up from the prisons cells below. The Judges chambers are above the courtrooms and they come down to bring light to those who are brought up from below. I have done a small cut away from the whole plan of the building in order to show you the design of a Jewish Miskan brought into the plan, as all the other major religions of the world are represented in one form or another. As you walk from the pyramid you can go either to the courtrooms or towards the Judges chambers. But this is what that part of the building looks like, making the pyramid the holy of holies in this evil Miskan "Temple". The bottom part of the above picture is the courtyard, and here we find finished stones brought in from the desert near Mitzpe Ramon where we find the worlds largest natural crater. A narrow channel of water that runs continually divides the stones. The architects claim to have been inspired from the Scriptures in Psalms 85:11 Truth shall spring up from the earth; and righteousness shall look down from heaven. For the Judges sit above this courtyard looking down. When you leave the center Courtroom or main courtroom directly across the opening you find the stairs going downstairs, at the base of the stairs you will find the fertility symbol always present in any illuminati structure, often hidden but always there. Much can be said about this symbol and the symbol of the masons with the compass and square with the "G" in the middle, but I will leave that for another time or for someone else. We have just lightly touched on the significance of this building for there are literally hundreds of details that point to the Illuminati and their plans for mankind. But more important to this report it establishes a base for the seat of the one that will be accepted by most as the messiah, before Yeshua returns to set up his reign and rule over the earth. I have no doubt that many will come against this report, and that the messenger rather than the message will be attacked. But I have tried to lay it out with proof and facts much more could be said and I am sure this will provoke others to say them, and possibly that is the intent of this article.